Director Panos Cosmatos (son of famed genre director George P. Cosmatos) blasts on to the international scene with the surreal horror movie Mandy (2018), starring Nicolas Cage as Red in full-on “Cage mode” – screaming, grunting and groaning as he takes revenge on a dark cult that kills his girlfriend Mandy and leaves him maimed. More than the premise, however, it’s a film shrouded in crimson flares and delicious stylistic excess, with nods in equal measure to David Lynch, Dario Argento and Clive Barker. The film is more of an experience, juggling various storytelling devices (including animation), and a journey into the dark corridors of the human psyche, than it is any straightforward horror film. And it’s all the better for it; a film that has already become one of the year’s hottest talking points. 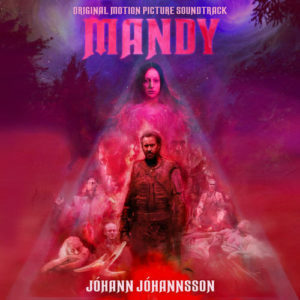 Unfortunately, Mandy turned out to the be last score assignment for Icelandic composer Jóhann Jóhannsson before his untimely death in February-2018. Jóhannsson had already become one of the most sought-after composers in the industry, with hits such as the gobsmackingly beautiful Prisoners (2013), The Theory of Everything (2014) and Arrival (2016) on his resume. Known primarily for his slow-moving, exploratory ambiance, his work provided a refreshing alternative to more traditional scores in Hollywood. We can only speculate how his stamp would have been felt, had he been allowed to develop further. In the film, the music is mixed up-front and center, taking on the role of a character itself – ebbing in and out of the visceral brutality. On album, it becomes more of a dark journey with its own internal logic. Make no mistake – this is typical Jóhannsson in its prevalent use of deep, dark chords moving slowly and determinedly through the film’s fictional universe. But the electronic, almost rock-infused tonal language is something we haven’t often heard from him before – something, perhaps, closer to the industrial explorations of Graeme Revell (The Crow, Dead Calm). A primary ingredient of the score is the distant two-note motif, probably an amalgam of electric guitar and synths, that is processed through heavy reverb, connoting some sort of dark, neverending abyss – on display in tracks like «Seeker of the Serpent Eye» and «Starling». A similar idea is used in the gorgeous «Mandy Love Theme», which is more of an acidic love theme, really – the distant, melancholy calls of the guitar and the broad synth layers signal a love that can never be. Sometimes these chords are heavily muted, as in «Horns of Abraxas» and «Red», as Cage’s character loses touch with reality. Other times, the score rips open with in-your-face heavy metal riffs, as the burlesque takes over in the Hellraiser-like confrontations with the demonic cult («Black Skulls», «Sand», «Waste»), or the delicious, retro electrobeats in «Forging the Beast» – a spellbinding montage sequence describing Red’s preparations for his revenge quest. Unquestionably one of the album’s highlights, as is the end credits track «Children of a New Dawn» (which was also released as a single prior to the soundtrack) . Mandy never reaches the heights of his magnum opus Prisoners, with its deep-seated, quasi-religious melancholy, and it’s no doubt a challenging listen outside its context with its incessant, suggestive nature relying on heavy chords rather than melodies. Instead, it wallows beautifully in a hellish landscape – as an echo from a realm beyond. It’s a fitting swan song for a composer that was all about mood and pushing genre conventions; one of the most unique and inventive film composers ever to come out of the Nordic countries. He’s tremendously missed.